I have played this little amp several times over the years but never got to really test it. This week I borrowed one from a friend (thanks Aad!) and took it on stage and tested it in my studio. I recorded a split video with it that faithfully reproduces its sound. The first thing that is striking about this amp is its extreme portability. Its dimensions are (HxWxD): 260 x 265 x 235mm (10.24 x 10.43 x 9.25 inches) and it weighs ONLY 6.2 kg (13.67 lbs) so this is by far the lightest and smallest amp I have ever taken to a gig. There is a padded gig bag that comes with it. It is really amazingly portable this way. The amp is 40 W and it carries an 8" twin cone full range speaker and a decent reverb. I am sure you can find more specs on the internet. Before I start wrting about my findings, I should make one observation though. If size and weight are not an issue for you, you should get something else of course. I am on a mission to get the best possible sound out of the smallest and lightest possible amp. That is what I am after and I fully realise there are better sounding (tube) amps out there. But these will invariably be bigger and heavier and therefore not worth investigating. I might as well stick to my Polytone then (with 15"speaker). I took it to the Crow without really being able to testdrive it at home and that was a bit of a mistake. I just placed it on the floor and plugged it in. I think this amp needs to be on a stool or on a stand (there is a provision for that on it). It was loud enough but it sure lacked some headroom. Also it sounded a bit treblier and boxier than I liked when I boosted its volume. This amp sounds fine in low volume situations (warm and mellow) but playing in a combo with a drummer you need something more substantial. Maybe this also had something to do with me placing it on the floor. At home the amp sounds just fine. At times I detected some boxiness but for an amp this small it still sounds pretty amazing, in the lower registers too. It should, because with a price tag of 679 euro it's pretty expensive. 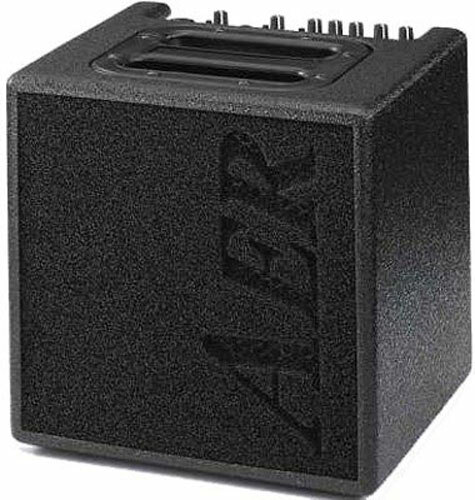 The AER amps were originally designed for the amplification of acoustic instrruments and they probably do a great job at that. It was never designed for electric guitars with magnetic pick-ups so some people argue there are better amps for that purpose. Yes, my Polytone Mini Brute with its 15" speaker does sound better. Still, after having played the ZT Lunchbox, the ZT Club, the Roland Cube 60 and the Ibanez Wholetone over the last weeks, I like the AER Alpha best until now. It does an amazing job at lower volume levels and its portability is unequalled (maybe apart from the ZT Lunchbox but that amp seriously lacked in the lower register and is no match for the AER Alpha therefore). 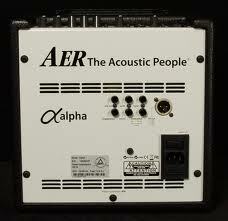 My conclusion is that the AER Alpha is great for drummerless, low volume settings and playing at home. For louder gigs in noisy environments the new and more powerful AER Alpha Plus (50 watts, 6.2 kg) or the AER Compact 60/2 (60 watts, 7.5 kg) seem a better option. I am sure these will provide more headroom and bass reflex. One of these is what I would go for in the AER series because I do want to take it out to noisy rooms. And now I guess you want to hear it. Like I said earlier, I think the sounds in the video are pretty representative for what it sounds like in a low volume setting. In the first one I am playing "Blues for Alice." And the second one is just some wanking on the changes of Autumn Leaves. I am playing the Tal Farlow. All EQ on the amp is flat and all controls on my guitar open. No sound tweaking was involved. Watch in HD! Really useful info - thanks D. Especially given the price of the AERs, its invaluable to get your take on them. BTW I continue to use a Roland 60 Acoustic and I'm wondering if the Roland you mention is the normal Cube or the Acoustic. I think I tried out the normal Cube Bill. Not a bad amp at all for the money by the way. Thanks,I've always wondered about that one.Presently I have an old Jazzkat and the first (60w) Henriksen stand alone.I think that I'll hang on to them. I use a ZT Lunchbox for rehearsals.